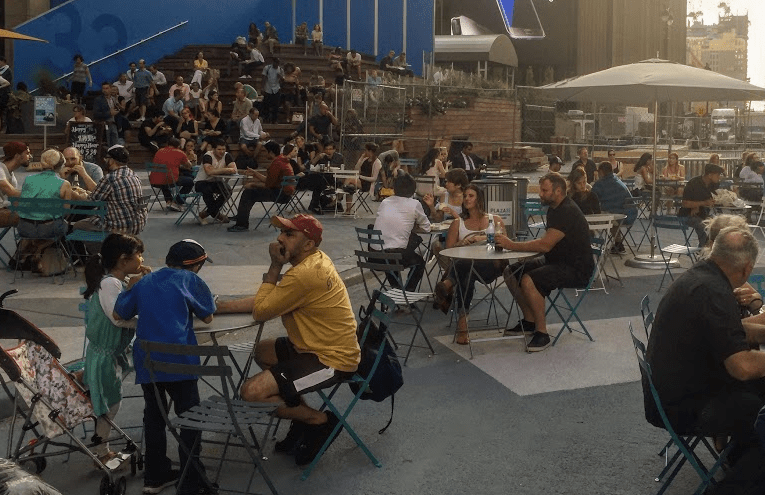 “Plaza 33” is back, transforming the eastern half of 33rd Street between Seventh Avenue and Eighth Avenue into a car-free public space — and it’s set to remain indefinitely. This is the second iteration of “Plaza 33,” which was installed from July through October last year and is funded and managed by Vornado Realty Trust. Next to Penn Station, the space gets some of the most intense foot traffic in Midtown and was filled with people yesterday evening. Plaza 33 launched sans furniture on Monday, and on Tuesday afternoon Vornado installed tables and chairs. A few fenced-in wooden bleachers remain under construction but are set to be finished in the next two or three weeks. The long-term future of the space is open-ended. There are no plans to remove it, nor is there a definite commitment to keep it, a Vornado spokesperson confirmed this week. 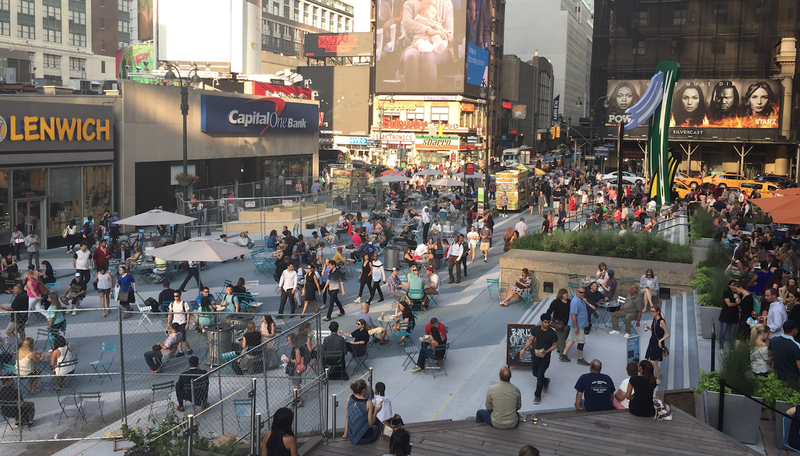 When this year’s plan was presented to Manhattan Community Board 5 in February, Vornado Senior VP for Development Marc Ricks said DOT would determine whether the plaza would be permanent after observing its impact over time. DOT has not responded to an inquiry from Streetsblog about when and how that decision will be made. I always thought that Lexington Ave should be pedestrianized or at least converted into a bus only route throughout. The subway is underneath. I hope it stays. Gonna check it out this year, missed out last time around. Are they still hiring 3 guards to ensure no one sits after 10pm? Return Park Avenue to its former beauty by reallocating 1 of its 3 lanes to a PBL in each durectiin, and chabge motor parking lanes to short term loading zones. I do like a lot of your suggestions. Especially the pricing for curbside parking. Just keep in mind, it’s very hard for buses (8.5 feet wide) to use a 9 foot lane. I kinda like London’s revised congestion pricing – pre-2005 private cars ( heavy polluters ) pay 2x, pre 1998? private cars ( extreme polluters ) pay around 10x; heavy polluting trucks pay up to €250 to enter central London. Can DOT Build a Plaza By Grand Central Faster Than DDC? Two new public spaces connected to the rezoning of Midtown East will be built out by DOT, not the Department of Design and Construction.